Oil painting on canvas by William F. Sawtell. Before treatment photograph by John T. Seyfried, on behalf of Galloway Art Conservation LLC. Object in author’s collection. 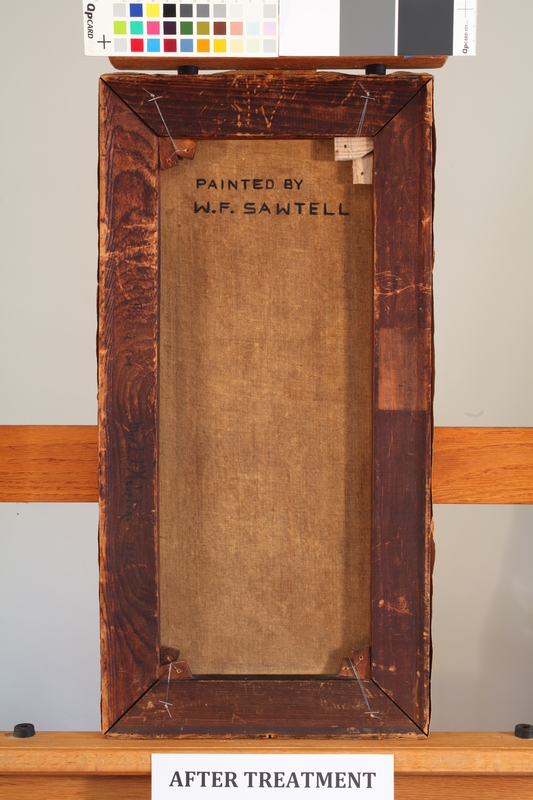 A few months ago, I acquired a small oil painting created by William Sawtell in 1892. I have written about Sawtell’s photography studio and his lesser-known artistic talents before, but I had never handled one of his pieces until this little study came into my hands. 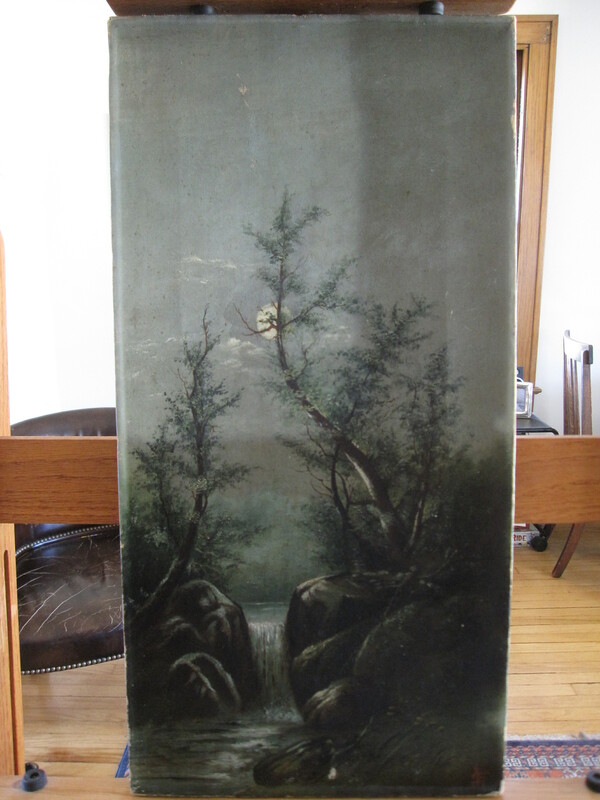 It is about twenty inches high and ten inches wide, painted on a canvas that Sawtell apparently fabricated himself. The canvas was brittle, with small splits and holes, and a few of the wooden keys (used to keep the canvas appropriately tensioned over the wooden stretcher) were missing. The image had darkened with time and there were several areas of loss where the paint had been damaged over the years. It just so happens that I know an excellent paintings conservator, Heather Galloway of Oberlin, Ohio. I took this little oil painting to her for an assessment and treatment proposal. She determined that the painting was in good condition and that its appearance could be improved by the removal of a varnish layer she did not believe was original. The varnish had been applied over “a significant deposit of dirt” and the way in which it was applied suggested that the painting was already in a frame at the time. We agreed that she would remove the later varnish, repair breaks in the canvas, and fill the areas of paint loss. Oil painting on canvas by William F. Sawtell. During treatment photograph by John T. Seyfried, on behalf of Galloway Art Conservation LLC. Object in author’s collection. The image above is a “during treatment” photograph that shows the difference made in the appearance of the painting by a partial removal of the darkened varnish and dirt layer underneath it. Once the varnish was totally removed, Heather could fill the areas of paint loss. 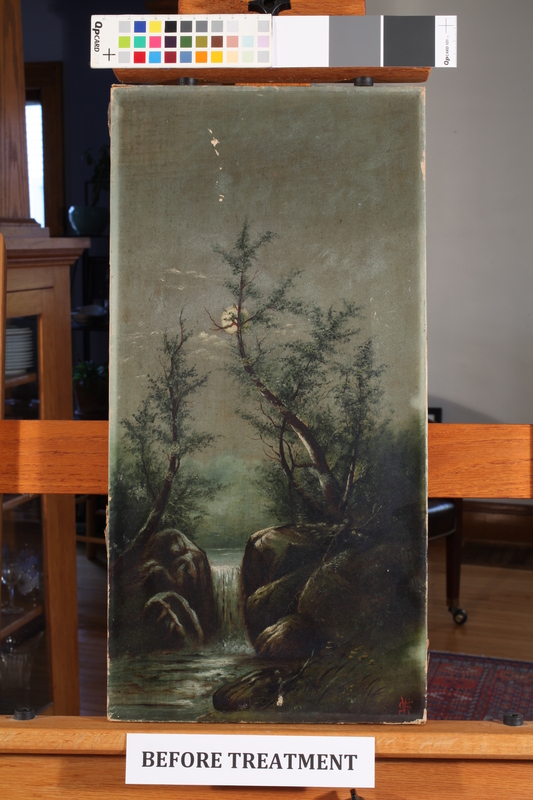 Verso of oil painting on canvas by William F. Sawtell. After treatment photograph by John T. Seyfried, on behalf of Galloway Art Conservation LLC. Object in author’s collection. The verso, or back, of the painting features a prominent black signature, “PAINTED BY W. F. SAWTELL.” (There are also small red initials painted in the lower, right-hand corner of the landscape.) Heather created new wooden keys for the stretcher, visible in the upper right. She fashioned a backing board with a window cut through it, so the signature would remain visible even while the verso of the painting was protected. What is difficult to see with the naked eye, but shows up nicely in conservation photography, is an additional inscription painted on the left side of the stretcher, shown below. 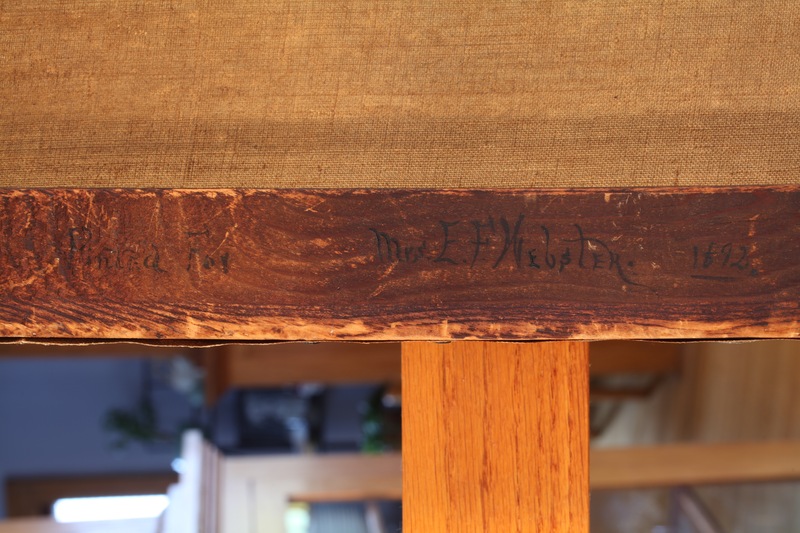 Detail of inscription on verso of oil painting by William F. Sawtell. After treatment photograph by John T. Seyfried, on behalf of Galloway Art Conservation LLC. Object in author’s collection. The inscription reads, “Painted For Mrs. E. F. Webster. 1892.” William Sawtell was lifelong friends with Edward Webster, a founding partner of Horr, Warner & Co. The two men served in the Civil War and it was Webster who handled Sawtell’s financial affairs when the photographer began to suffer from mental illness in later life. Identified as Sawtell’s guardian in his probate documents, Edward Webster served as administrator of the estate and paid for expenses including “getting body of Wm. Sawtell home from Cleveland” and clothing it in a new shirt for burial. 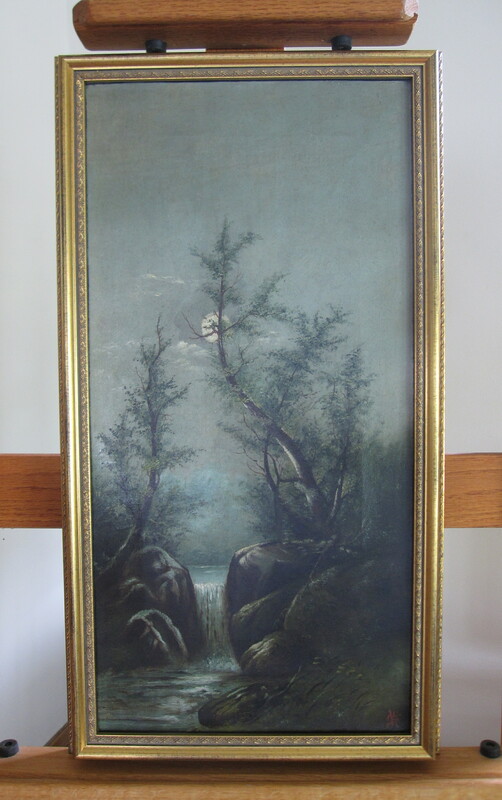 This little oil painting was apparently crafted as a gift for Edward’s wife, Flora Ladd Webster (1846-1917). 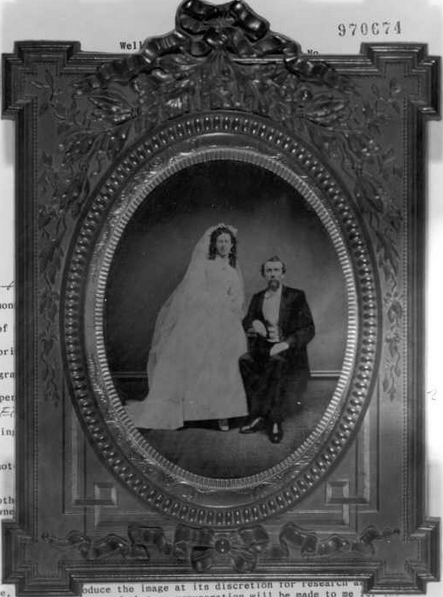 1870 wedding portrait of Flora Ladd and Edward Webster, taken in Wellington, Ohio. Photo 970674 of “Wellington Family Album” Collection, Herrick Memorial Library. Permission to display generously granted by the library. After the conservation treatment was completed, Heather assisted me in the selection of a modern frame, the original frame being lost. We chose one that had a period feel to it, gold toned and slightly ornate. Heather lined the new frame with felt to prevent abrasion, and secured the painting in place with modern metal mending plates. I am very pleased with the results. Oil painting on canvas by William F. Sawtell. Photograph by Heather Galloway. Object in author’s collection. It makes me happy to think that this little jewel is back hanging in a Wellington home. If you have local history treasures that you believe should be preserved, post a comment or send me a message. I can put you in touch with a terrific conservator! UPDATE: Per an exchange in the comments below, here is a candid shot of the back of the object. The outermost, cream-colored rectangle is the modern frame. The dark rectangle nestled inside that is the original canvas on its stretcher. The white, central rectangle is a backing board made of a conservation material called Coroplast; this protects the fragile back of the canvas and does not give off any chemicals that might harm the painting over time. You can see that Heather cut a window through the Coroplast (covered with transparent Mylar) so that the signature remains visible. She also attached the metal mending plates to the new frame, so that they neither touch nor damage the original wooden stretcher of the painting. 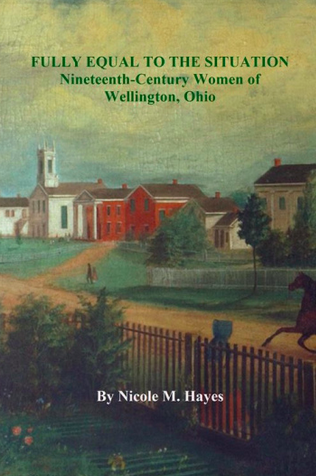 This entry was posted in Art, Genealogy, History, Material culture, Ohio, Wellington on May 30, 2015 by Armchair Historian. Thank you so much! That is very kind of you to write. Fascinating! But I’m confused – are the stretcher bars (with the “Painted for …” inscription on verso) still in the new frame and visible if one turns the painting over? It doesn’t look deep enough, somehow. Yes, Lynne, the original stretcher is totally intact. A conservator’s code of conduct, like a doctor’s, is “do no harm.” They always attempt to interfere as little as possible with the original object, and they choose sympathetic and reversible modern materials to do their mending and filling. In theory, using the written reports that Heather prepared for me, another conservator could take the painting and totally reverse her work tomorrow. I don’t think I can post an image in the comments, but I will take a photo of the back of the frame and add it to the post so you can see more clearly. Thank you for the update! Conservation is a wonderful field, isn’t it? So glad you found someone who seems to really know and love her work to restore this painting for you! She is marvelous! I highly recommend her to anyone who might be thinking about having this sort of work done. This painting is incredible – love the local connection and subject matter of this piece of artwork. 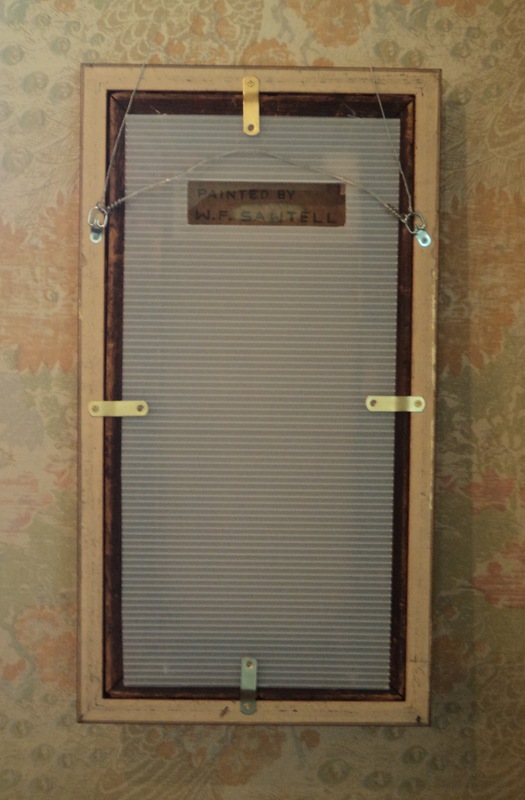 I would be quite excited to find a Sawtell painting to hang in my Museum or at the Historic Shupe Homestead!